Mariana Stjerna is a highly respected Swedish channel and author. She has been psychic since childhood and has written several spiritual books both for adults and children. The Bible Bluff is the English publication of her Swedish novel Graalens gåta. Other examples of her international releases include Agartha – The Earth´s Inner World, On Angels’ Wings, and the upcoming Mission Space. The Da Vinci Code tells us that Jesus and Mary Magdalene were a couple and had children together. Is that really correct? Did Jesus die on the cross or did he not? What about the Immaculate Conception? Why was Reincarnation removed at the meeting in Constantinople in the year 553? What function did the Grail have and is it true that Joseph of Arimathea collected the blood of the crucied Jesus in it? Where is the Grail now and what mission will it have for humanity in the future? Who was the real Mary Magdalene – a whore or a saint? Was she perhaps the mother of the women’s liberation movement? You will find the answers to these questions and much more in this book. Here is a new version of the life of Jesus and what happened in biblical times. The author’s spiritual contact has visited these times and has amazing things to tell. It is time for the Truth to be revealed the way it has been told to those who listen. But it is up to the reader to listen to their inner Truth, which is hidden in their heart. 3. The First Shock: There Were Two Jesuses! Many years ago my husband and I visited Glastonbury in England. It was in the month of May, when all England blossomed with a rare splendor. I was curious about the Grail story, which has always lain secretly dormant in my heart. Now I wanted to know more about it. Excavations have shown a complete spiral maze around the Tor. It is evidence of the hill’s ritual use in Neolithic times, 6000–1800 BC. A small path with steps led up to the world-famous well under which it is said that the Grail is hidden. When we reached the top we had a wonderful view over the lovely landscape, but the most interesting thing was Chalice Well, the well of the Grail. The source of the water of the well is unknown, but the water fills the five-sided well-chamber and flows through a separate pipe, from the spring underneath the garden, out through a lion’s head. Even during severe drought the water never stops flowing. The well has a very beautiful wooden lid, and from here the water runs step by step down into the valley. The wooden lid above what is called the well of the Druids shows a pre-Christian symbol, which the early Christians believed to represent the sign of the Fish. It also represents the blending of the masculine and feminine and denotes the meeting-place of conscious and unconscious worlds. When we visited this wonderful place we met an elderly lady tending the flowers. She looked as if she were straight out of an English gardening book from the eighteenth century. She wore a wide-brimmed straw hat and thin gloves and carried a basket on her arm. She had a clear-cut, friendly face, and she asked us if we were tourists. Of course I asked her about the Grail. I told her that I had read somewhere that it was hidden near the well or maybe beneath it. She smiled and told us that she had seen the Grail – the real one! It really existed here in Glastonbury. It had been found and hidden again and was a very beautiful goblet with jewels and carvings. We had a long and interesting talk, but I am unfortunately unable to recall the details. She seemed very well informed about the history of Glastonbury. After that we wandered about in the surroundings of this magic well. We saw the beautiful thorn tree where Joseph of Arimathea is said to have planted his staff. He placed his staff into the ground of Wearyall Hill, and in that spot a hawthorn tree grew and flowered. We could not have seen the same one, but we may have seen an offshoot. Many symbols are related to the Grail. Some sources tell us it is not a goblet, some say it never existed, Dan Brown believes it is a woman’s (Mary Magdalene’s) womb. Various artists have expressed very different ideas about the magic goblet and made it historic. I believe that the tale of the Holy Grail in this book is trustworthy. However, I ask the reader to form his or her own opinion. Ever since my confirmation I have had difficulties understanding and enjoying the Bible. I find it a very illogical book. I have tried talking to clergymen, but they seem to swallow everything without question. I have read the Apocrypha and a lot of gospels, besides the four in the Bible. I read about the Meeting of Bishops in Nicaea and was angry to see Christianity being treated in such a careless and arbitrary way – a religion they were supposed to be preaching. From childhood I could not understand why anybody should be put on a pedestal. Are royalty, politicians, actors, or other celebrities more remarkable than you and me? As a child I thought, “Oh dear, they all need to go to the toilet!” Nobody can live forever, and that’s something we all have in common. Of course there are different degrees of knowledge and wisdom, but that doesn’t prevent people from being people. And that is what I want to relate: the human element in all the greatness and holiness described in the New Testament and, as far as that goes, in the whole Bible. The human element is the main theme in my search for the one and only Truth. Jesus was searching for the Truth like you and me. He had supernatural powers because there are such powers. Some of us are born with them. If you seek them, you find them. He looked for them and found them on his journeys. But he also had a wife and two children, and he loved his family. I read somewhere that he found fasting unnecessary. You’ve got a body in order to care for it, not to make it consciously suffer, he thought. If you feel shocked, hurt, or even offended by Jan’s visits to the biblical story, please put this book away! But let me also explain that it acts as an intermediary of Love to the Truth and Beauty of what really happened. “The Truth shall set you free,” said Jesus. But we don’t always want the Truth, because we like to create our own Truth. After that we put on our blinders. Come with me on a very unusual journey. Try to feel liberation instead of dismay. It is time that the Truth inside and outside people is revealed the way it was mediated to those who wanted to listen. This book is written in the I-form, because I will now deliver the words of my Angelic friend Jan. Please, my dear readers, listen above all to your own Truth that is hidden in your heart. My name is Jan Fridegård. I want to introduce myself to you in order to explain how and why this book was written. When I lived on Earth in my last incarnation I was quite a famous Swedish writer. My father was a farm worker. We were very poor, and I had a tough childhood. I wrote about my youth and people liked it and suddenly, after much hard work, I became popular. Before I died I told a friend that I had no intention to stop writing “up there.” I found a medium (a psychic), Mariana Stjerna, and I am now able to tell you about my adventures in other worlds. I now belong to the Angelic Realm. I have been here since 1968 and I have enjoyed every minute of it (although minutes don’t exist here!). In two previous books I have described my journeys in the cosmos. 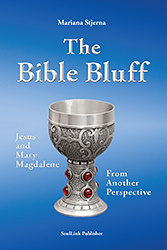 In this book I made excursions into the times of the New Testament, and it was a thrilling experience. You may not recognize the names of my friends and companions, so here is some background information. Oshio was my leader on a planet where the Central Race lives. (You can read about the Central Race and the Wingmakers on www.wingmakers.com.) I was living there (as an Angel) when I was ordered to go back to the Angelic Realm and write this book. Kualli is a kind of General for the Angelic “army.” He was a Native American when he lived on Earth, and a very good leader of his tribe. He now organizes my travels between the worlds. He is a very interesting and wonderful spirit. Zar is my best friend and companion among the Angels. He is one of the Masters and often follows me on my journeys. He and Kualli support my search for the Truth, and nothing but the Truth. And now, dear readers, this journey into the past can begin! Hello, Earth! This is the Truth-finder Jan from the Angelic Realm calling his medium on Earth. I have a lot to tell you. I have made the most fantastic journeys back in time, to biblical times. I wanted to know what really happened, and I did find out, sometimes in a very dramatic way. When I was called to make these journeys I was living in another reality, visiting the Central Race in another Universe. The Master who was leading my path was Melchizedek, and I was going to meet him again. Melchizedek was waiting for me in the main library inside the great Cathedral. Of the High Masters, he is the one that I like the most. He is grand, strong, handsome, and full of warmth and humor. The main library is the beautiful room where we met Oshio the first time we visited the Central Race. Oshio is one of the cosmic guides and, to my great surprise, he came right towards me when I entered the Cathedral. When we had greeted, he took my hand and led me to the main library. I didn’t dare to ask what would happen, but probably I would get a new mission. Melchizedek was standing at a large table with remarkable sculptured table legs. He embraced me and kissed my cheeks. Then we all three sat down on a comfortable sofa at the short side of the room. “When may I go?” I asked, and probably my eyes were shining. Think about returning home again! I would get closer to my beloved Earth. That alone was wonderful. “Soon,” Melchizedek promised and exchanged a look of mutual agreement with Kualli. My interior cheered. They wanted me back over there. I would become myself again! At least I felt so. I have no memory of the journey back to the Angelic Realm, and perhaps I wasn’t supposed to have that either. What is termed magic on Earth is an everyday occurrence on this level. When I awoke I felt soft down feathers under my back and I immediately glided down a familiar slide, consisting of the wing of the Angel Jolith. My friend Oshio had disappeared and so had Melchizedek. Instead I flew into the familiar arms of Zar, a dear friend and leader. I knew very well the flourishing meadow we had landed on. Behind Zar my Angelic group was singing out loud and threw flowers at me. I felt very welcomed indeed. “You need to rest for a while,” said Zar, and he took me to my own dwelling, which stood in beautiful surroundings just as I had left it. I don’t know how long I had been in the promised land of the Central Race. Time means nothing here, and I would soon learn that in a more tangible way. It was nice to be back home, and I instantly laid down on my bed and fell asleep – for how long, I don’t know. Now my curiosity had been awakened, and as I prepared for the upcoming visit with General Kualli, I bombarded Zar with questions. He just smiled and refused to answer. I had to wait; he was not going to present the mission to me, Kualli was. He was certainly the highest General of the Angelic Army, and he was a tremendously wise and interesting person and in addition to that an Indian. So there was another happy reunion. Kualli’s room was comfortably and snugly decorated. Zar and I sat down on his lovely green silk sofa. Neither we nor the sofa were physical, so our weight on the sofa was invisible. I love putting my buttocks on a comfortable sofa without leaving any imprint! “It’s time for a fantastic revelation,” began the General. I leaned forward and was all ears. “The Old Testament is a Jewish tale, built on real events in history, some chronicles, and some myths and legends,” Kualli continued calmly. “No, Jan, this is no history lesson, just a reminder. We want you to understand the very basis of your mission.” Kualli was very serious now. “I just want to tell you that this meeting included many people, many arguments, and endless discussions about the content of the Bible, and that it went on for a very long time. Those who made notes of the original text were mostly monks, but also good storytellers. The Jews had the Old Testament written down, but there was also a verbal tradition for centuries. The New Testament is a mixture of four gospels and some other tales. These gospels consist of a selection, made at the Meeting of Bishops. In fact, there were about eighty gospels to choose from, and they had to limit the contents of the Bible. There is much more to tell you about all of this, about the search that did not give priority to the Truth, but instead was focused to give the priesthood more power over the people. “So I will go to various ages in places that are connected with Christianity?” I asked, rather surprised. I stared at my old friend Kualli and my best friend Zar. Both were silent, staring intensely at me. I felt hesitant. Two prophets with the same name could certainly give rise to confusion and mix-up. If this was the case, there must be huge changes in the interpretations of the Bible. I suddenly felt like a pioneer, and I liked the feeling. I felt both flattered, exuberant, and scared. It was child’s play to travel to various indigenous tribes in other realities, compared to this mission. Partly I must have substantial knowledge, partly I had to know where I was aiming. I also had to know how it would happen. Zar took me to another room in the Angelic school. There was a comfortable bed, a couple of armchairs, and a table with a recording-machine on it. I lay down on the bed. After a short while, a woman came into the room. She must be an Angel, of course, I thought. She had a pleasant – in fact quite lovely – face and long, curly light brown hair, big blue eyes, and a finely chiseled profile. “I have no objection to you being visible.” I smiled, looking at her. She smiled back and disappeared. I did so, and Zar covered me with a sheet. I don’t know what magic he worked, but I fell asleep immediately. When I looked down at my body I wore a snuff-brown robe and on my naked feet I wore sandals. I looked around and saw that there was nothing but desert. Well, not entirely, since further away there were some gray rocks flocked around a big cliff. “Are you there, Lydia?” I hissed. She soon appeared, the beautiful smiling lady I’d met a while ago. I decided to walk to the cliffs. Not that I was used to walking in desert sand dressed in Arabic clothes, but it was surprisingly easy, although I had acquired human form. Soon I was facing a cave-like opening in the gray granite rock. A young boy crept backwards from the narrow entrance of the cave and ended up right in front of me. He was dressed in a loose shirt that was dirty and torn. He looked terrified when he saw me. He held several parchment rolls in his arms. “I’m from another village and I can read,” I answered. He would probably be scared if I told him I was a stranger from another time. “I would like to have a look at those scrolls,” I said. He threw the scrolls in front of me and ran away. Terrified, he looked at something beside me. I turned around and Lydia was standing there, laughing. “They couldn’t be the Dead Sea Scrolls, could they?” I wondered, with awe in my stomach and knees. In front of me were very old parchments, yellow-brown and frayed. I would probably not be able to read them, but I carefully took one and rolled it out on the sand. The writing seemed well-preserved, plainly written in a clear hand. I realized I had only looked one way. I was standing on sand, but all around me as far as I could see there were small rocks and high hills. The vegetation was sparse, but bushes and grass were everywhere. “Why am I dressed in an Arabian burnous, and what will happen to the boy? Are there more scrolls in the cave?” I really felt confused. “Who will decipher them?” I wondered. Lydia motioned for me to pick them up. I got an armful. At this juncture, we heard shouts and screams. Far away we saw a trail of men, armed with cudgels and swords glinting in the sun. Lydia took my hand and we both disappeared – with the scrolls. I don’t know how it happened, but I opened my eyes in the room where the dream had started. Was it a dream? Do Angels dream? On one of the walls in the room, text appeared. It looked like subtitles on a movie screen. What it said startled me once again at the ignorance of people – or the fact that, for ages, they have been kept ignorant of the Truth. The language of the scrolls was very old-fashioned and complicated, but I will try to translate it into a more modern language. It is now fifty years after the Crucifixion of our beloved Master Jesus Christos. I, Simon Zebedee, describe a remarkable human fate, which is closely associated with the life of the Master. As a scribe and a close friend of Joseph of Arimathea, I assure the reader of my scroll that what is written here is the unconditional Truth. I am an old man now, but my memory is unsullied and reliable. In the course of time I made notes and they have helped me to write this scroll. I will tell you about the younger Jesus (Issa) who was also a very great prophet, but not in the country of his birth. He was like a son to me. Jesus (Issa) was born in Jerusalem at the same time that the older Jesus was in Jerusalem with his parents. At that time, Jesus was twelve years old. As was customary with boys at that age, he visited the Temple of Jerusalem at the Passover festival in order to be examined by the board of the elders. At the same time, in a beautiful house in the middle of the town, a young woman called Mary (like the mother of Jesus) was in labor pains. Her husband was a merchant and a Nazarean, and thus he didn’t belong to the Jewish belief. The Nazareans were the original Christians, and they were not in favor with the Jews. The merchant Judas Immanuel was highly esteemed by most people in Jerusalem. He led an honorable life with his wife Mary and four daughters. Mary wished for a son this time, and her wish was fulfilled. There was nothing strange or supernatural about the birth of this little boy. There were no Angels singing, but the child smiled almost at once and he seemed to recognize his parents. Jesus was a common name at that time and the boy was baptized Jesus Ibrahim because his mother wished him to have that name. Her father and her beloved brother were both called Ibrahim. At the time of his baptism in the temple, a sunbeam fell right on top of the head of the child and stayed there during the whole ceremony. It was considered peculiar and unusual, and the young Mary was convinced that her son was going to be a great prophet. His father was of a different opinion. As Jesus (Issa) was the only son, his father expected him to be an heir to his well-established company. Jesus (Issa) grew up to be a wise and beautiful boy. He loved animals very much, and the family’s home soon was filled with different animals found by the boy in nature. They were often half dead or wounded. He cured them. His father thought that the boy’s common sense and patience cured the animals, but his mother considered her son a chosen one from the Angelic hierarchy showing his divine heritage for the humans. He had the gift of healing, and that gift was considered to be given to him through the sunbeam at his baptism. His sisters were not at all impressed and treated him as a spoiled child. In the beginning no one but his parents, sisters, and some friends knew about his gift of healing. To boast about this could annoy the Jews and provoke them into calling him a traitor. I was the only one who knew about this, because I was a friend of his father. I also often talked to Joseph of Arimathea, and that way I could compare the talents of both boys. I knew that the older Jesus was wandering about in Palestine and also in other countries. I had heard some of his prophecies and speeches and I had also witnessed some of his miracles. When I told Joseph about the younger Jesus, who had grown up to a young man in his early twenties when the older Jesus was crucified, he didn’t want to listen. For him, there was only one Jesus of importance. I was of a different opinion. The young Jesus had not yet a reputation as a prophet, but he performed miracles among the small circle of people who surrounded him. After the Crucifixion of Jesus Christos, I joined that circle. I was curious to know how Jesus Ibrahim lived and taught. His father was deeply worried. His son didn’t want to work as a merchant, in spite of the prosperous business. His father was involved with the Essenes, a brotherhood living in villages on the other side of Jordan. Among other things, he sold their textiles, specimens of woodwork, dried herbs, and also some fresh food. I knew that the young prophet had acquired a lot of their knowledge and faith and that he tried to spread these among his friends. But that, too, was dangerous, since the Romans hunted the Essenes. “Neither,” Kualli said, smiling. “They were simply a brotherhood that dated back to unknown times – in any case, very long ago. According to old scriptures, Christianity came with the Essenes and not with Jesus. He preached what he had learned in Essene monasteries and on his journeys. Something quite different was fabricated in the year AD 325, at the Meeting of Bishops in Nicaea. But I will give you a swift history of the Essenes, because I think we will hear more about them in connection with the two Jesuses. “You would know a lot more about the Essenes if you had read the Dead Sea Scrolls. A group of them lived in the monastery of Qumran, another in the monastery at Mount Carmel. They also lived in other places in Palestine and in Egypt, near to the water. Many of their villages and monasteries were situated at the river Jordan. In their villages there were good craftsmen, gardeners, farmers, smiths, carpenters, tanners, and others. The villages were in fact like big families. Today you would call them communes. The family was revered and the children were important, both one’s own children and others’. “The Essenes took care of orphans and abandoned children. They lived very healthy and most of them were vegetarians. The women helped each other to spin, weave, sew, and cook. In the monastery there were only men. They used to rise at sunrise, go down to the shore, and bathe. They were always in contact with the four elements, and the forces of nature were holy to them. After bathing they dressed in clean white cloaks, woven in one piece, and meditated together. All this seemed very exciting and I went on reading old Simon Zebedee’s message about the two Jesuses. Judas Immanuel, the father of Jesus (Issa), decided to send his son to Qumran. There he would get a very thorough education and at the same time learn reverence and respect. Jesus started at the school when he was ten years old and stayed there until he was twenty. These ten years of learning then characterized his whole life. Jesus Ibrahim grew into a knowledgeable and developed Essene. He was neither orthodox nor unfaithful; he was just an Essene.